With the 1 year LIBOR Rate at 2.77%, there is not a big hurry to refinance "reasonable" ARMS now. Do you know that $1B of insider selling needs the equivalant 1,000 investors investing $1,000,000 each to offset the selling pressure? 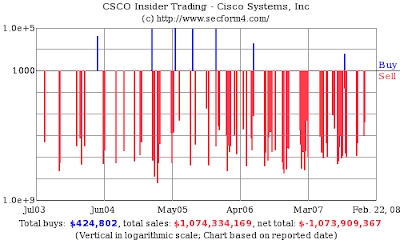 Click this chart below from the SEC Form 4 Sec Filings for Cisco Insider Trading and Stock Options to see the full details. I owned Cisco stock in the past for a nice ride from $17 to $24. I sold it after the ride as I thought there were other companies who were far more "shareholder friendly." These days many technology stocks, such as yours, are way off their 2000 highs so I am again taking a look at Cisco Systems for potential purchse. 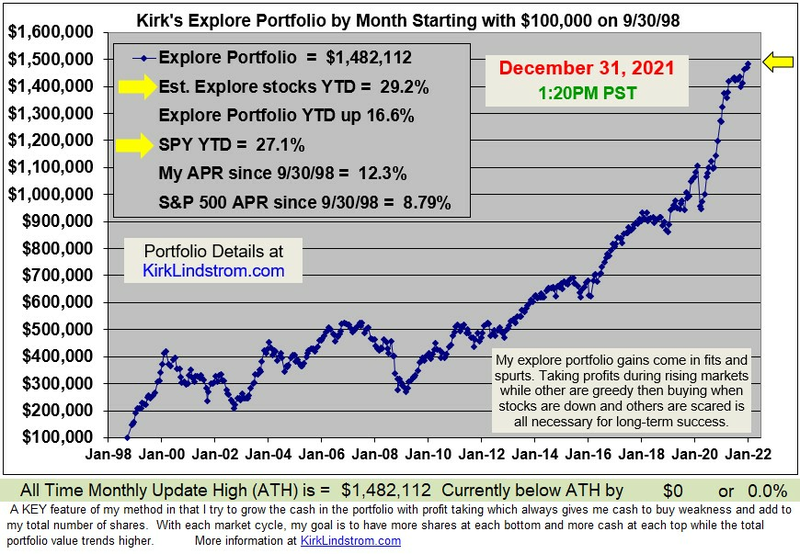 Why should I invest my hard earned money into a stock where the insiders have sold nearly billion dollars worth of shares with only $424,802 in purchases? Are all you insiders waiting for the "3-gap-play" to buy at $17.50? If so, why wasn't there a mad rush of insiders buying at $17.50 the last time the stock was that low? Maybe I will join you in buying at $17.50 if there is a rash of insider buying greater than insider selling. Otherwise, I may buy shares in companies where insiders have more confidence for the long term. Compare Cisco to Valence (VLNC), a company I have dollar cost averaged into since selling my Cisco stock. Valence has nothing but insider buying. Funny thing: I've made money on the Valence! This seems to confirm that insiders know real value and will invest their own money accordingly. I have a hard time resisting a GREEN company with great growth opportunity when insiders are putting their own money into the stock rather than cashing in low priced options. For more on Valence, see my articles "OEMtek Uses Valence Batteries for 100 MPG Prius Conversion" and "Valence Technology: A Green Stock with Potential." Feel free to send me a note when you insiders at Cisco Systems start buying your own shares again using your own money rather than shareholder money. Disclaimer. I have been accumulating Valence in my newsletter and personal portfolios and have very good profits already at the current price of $2.97. I plan to continue to trade around this core position in an attempt to increase my overall return. I expect Valence to be a very volatile stock. Today's front page of the San Jose Mercury News business section has a feature story on how OEMtek's $12,500 conversion using Valence (VLNC) batteries can improve the gas mileage of a Toyota Prius by double or more. For $12,500, OEMtek says it can add a bigger battery pack to your Prius and double its mileage - to 100 mpg or more. "There are people who want this right now, no matter what," said Cindi Choi, vice president of business development and the de facto chief executive of the six-employee company. OEMtek will be ready to convert about 30 Priuses as soon as March, Choi said. It has battery packs on hand and continues to do durability testing and other late-stage engineering work. Its Web site (www.oemtek.com) has a "buy" link where customers can pre-order the vehicle. Batteries come from Valence Technology, a Texas company (that I cover in "Kirk's Investment Newsletter") that says 80 companies have tested or used its batteries. Chairman Carl Berg is a Silicon Valley investor and real-estate developer. He's been doing test loops of the OEMtek cars from his Mission West Properties offices in Cupertino, averaging 89.81 mpg. Valence recently announced a $70 million deal to sell batteries to the Tanfield Group, a British company that makes Smith Electric Vehicles vans and trucks. 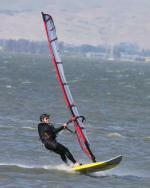 "We think this can be a very major business," Berg said of the OEMtek BREEZ. "We believe there can be 100,000 people or more easily that will buy this add-on to their Prius." It should not be long before somoene has a solar panel you can put on the roof of your "plug-in electric vehicle" (PEV) at work or while camping to charge the PEV off the grid. I may email the 6-person company and suggest that task for employee #7. "Fund managers and asset allocators are the most risk averse in more than seven years," reports Merrill on Wednesday. "A net 41% of fund managers say that they are overweight cash -- a level last seen in the aftermath of the '9-11' terrorist attacks. … Investment time horizons have almost shrunk back to extremes last seen in March 2003, while the number of investors adopting risk-averse investment strategies has hit new highs." Merrill calls this "an unprecedented combination of high cash levels and low risk appetite." "It's because the Merrill survey is a contrarian investors' bible. When there's an extreme consensus in one direction or another, that's usually a great moment to take the opposite bet. And if fund managers are now as nervous as they were just after 9/11, that makes a tempting case for putting some money into the market right now. No fewer than 79% of fund managers expect the outlook for profits to weaken in the next 12 months. Two-thirds expect the global economy to slow down. And there are seven fund managers overweight cash for each one who is underweight. That's the highest ratio since Merrill began tracking the numbers seven years ago. As recently as November, the ratio was less than three to one. " Not only are fund managers at Merrill Lynch bearish, State Street reports investor confidence is near its record low, set in December 2007. "Global Investor Confidence rose by 3.0 points from a revised December level of 65.8 to reach 68.8. North American investors were responsible for the bulk of this, as evidenced in the rise in the North American Confidence Index from 65.3 to 71.8, but European investors also contributed with an increase in risk appetite from 85.0 to 86.6. Among Asian investors, confidence retreated slightly from 85.6 to 85.4. " My three charts here show the State Street Investor Confidence Index is the second lowest reading ever dating back to mid 1998. Dow Jones announed today they will replace Altria (MO, the old Phillip cough-cough Morris) Group and Honeywell International (HON) with Bank of America (BAC) and Chevron (CVX) in its benchmark Dow Jones Industrial Average effective Feb. 19. Dow Jones last changed its index in 2004 when American International Group Incorporated, Pfizer Incorporated and Verizon Communications Incorporated replaced AT&T Corporation, Eastman Kodak Company and International Paper Company. VZ : Verizon Communications Inc.
DD : E.I. DuPont de Nemours & Co.
GM : General Motors Corp.
JPM : JPMorgan Chase & Co.
HD : Home Depot Inc.
GE : General Electric Co.
MRK : Merck & Co. Inc.
PG : Procter & Gamble Co.
WMT : Wal-Mart Stores Inc.
UTX : United Technologies Corp.
XOM : Exxon Mobil Corp.
IBM : International Business Machines Corp.
AIG : American International Group Inc.
AXP : American Express Co.
DIS : Walt Disney Co.
Chevron was taken out of the DJIA in 1999 to make room for HPQ, MSFT, INTC and HD. 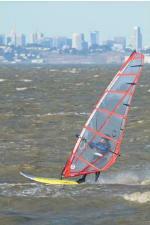 Valence (VLNC Charts) will be a key player in reducing carbon footprints thought to cause global warming. Its safe batteries are also a strong candidate for laptop computers and other portable devices you don't want to burst into flames. Thursday, February 7th, Valence announced a $70 million order with The Tanfield Group Plc (London Stock Exchange: TAN ) to manufacture and supply safe, Lithium Phosphate energy storage systems to power zero emission, all-electric commercial delivery vehicles. The Valence battery systems will be installed in leading-edge vans and trucks produced by Tanfield’s UK-based trading division, Smith Electric Vehicles, the world’s largest manufacturer of electric vans and trucks. The stock jumped on the news and rewarded those of us who had been accumulating the stock in hopes they would commercialize their technology. 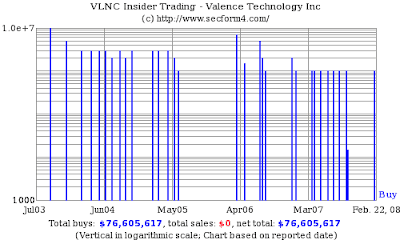 Last quarter, Valence reported a loss of $5.7 million, or 5 cents per share, for the three-month period ending Dec. 31. For the first nine months of fiscal 2008 ended Dec. 31, Valence reported a net loss available to common shareholders improved to $15.0 million, or $0.13 per share on total revenue of $13.0 million. Going from maybe $20 million a year to perhaps $100 million a year will not be an easy task but it is a problem everyone wishes to have. Under the agreement, Tanfield will purchase up to $70 million of Valence products in the contract’s first phase and Valence has already received a firm purchase order for the first calendar quarter. The agreement will also result in Tanfield becoming the first volume customer for Valence’s third generation Lithium Phosphate Epoch™ technology, a battery system equipped with an advanced management system that monitors and automatically adjusts cell performance so battery packs operate at their optimum performance capacity. Epoch benefits include a fail-soft capability that is designed to eliminate system failure caused by a single cell and to have a life cycle comprised of more than 2000 charge cycles when deep discharged in demanding electric vehicle applications. "Our phosphate-based Saphion® Lithium-ion technology is a break through battery chemistry for mobile computing and for large format applications such as back up power supplies and electric vehicles. Saphion® technology, is safe and stable. It delivers high cycle life, great energy density, no maintenance, superior rate capability and long service life. These characteristics make Saphion® technology suitable for not only the traditional Lithium-ion markets such as the consumer and computer industries, but also for emerging markets not currently served by Lithium-ion technology, such as the telecom, utility and motive markets. Saphion® technology offers the power of Lithium-ion with the safety, environmentally friendly and cost benefits of phosphates." Warning: Valence has had its optimists in the past as the price volatility shows. I like to buy stocks like this AFTER they have crashed with the hopes they eventually bring their technology to market. With this $70M order, it looks like I may have done so again. Disclaimer: I have been accumulating VLNC in my newsletter portfolio and my personal accounts with some trading around the core position. I have a gain at the current price with plans in place to take profits as it goes higher and protect profits should something happen. 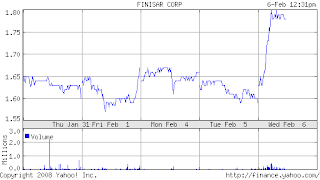 Today Finisar (FNSR charts) is up 11% after the good news from its competitor, JDS Uniphase Corp. (JDSU) lifted that that stock 28%. 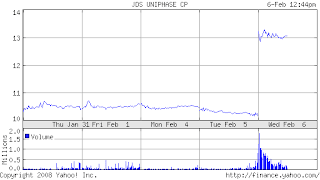 Yesterday JDS Uniphase reported fiscal second-quarter revenue rose 9% to $399.2 million. FY Q2 net income fell 8.6% to $21.2 million, or 9¢ per share, from $23.2 million, or 10¢ per share, a year earlier. If you exclude onetime gains and benefits, JDS said earnings would have totaled 22¢ per share in the quarter ended Dec. 29. On that basis, JDSU easily analyst consensus for earning of 12¢ per share on revenue of $386.4 million. Even better news at a time the market is full of bad news, JDSU indicated their Q3 revenue might also beat analyst estimates of $390.2 million. JDSU predicted sales of $380 million to $402 million. This great news from JSDU was enough to have FNSR up 11% so far today. 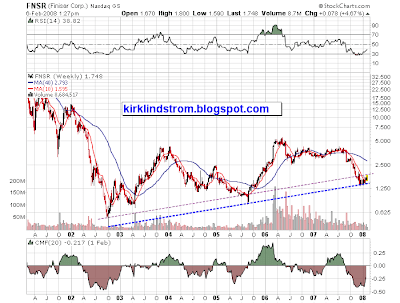 Finisar remains a good GARP stock. GARP means "Growth At a Reasonable Price." The acknowledged trouble with the sector is it needs consolidation because profit margins are low with too many suppliers chasing too few companies like Cisco. The leaders are Finisar, privately held Avago Technologies (where I used to work on fiber optics in the 1980s and early 1990's when it was part of HP before it was spun off as Agilent) and JDS Uniphase. Jim Cramer Fans will remember he liked the stock in the $4s and $5's but gave up on it with this bearish call in May 2007 around $3. Will he get back into it before its next run or will he wait again for $4? Finisar: "No. I liked FNSR ... Their time has passed. They didn't get the big orders." I like Finisar and have added to it at these low prices. I expect to take profits as fiber comes back into fashion, especially after TV personalities like Jim Cramer start to talk about it again, but I consider it a good long-term investment for those who can stomach its high volatility. California's Super Tuesday is Tomorrow. Who is Best for America? California Governor Arnold Schwarzenegger and former NY mayor and presidential hopeful, Rudy Giuliani, endorsed 71 year old GOP nominee John McCain. His wife and niece of the late president John F. Kennedy, Maria Shriver, endorsed Barack Obama along with her uncle Teddy (Senator Edward Kennedy) and cousin, Caroline Kennedy Schlossberg, endorsed Senator Obama a week earlier. Oprah is another big name behind Obama. 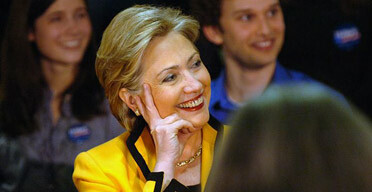 Hilary has her popular husband, Bill Clinton, leading the charge for her campaign. Whomever you like, make sure you vote!